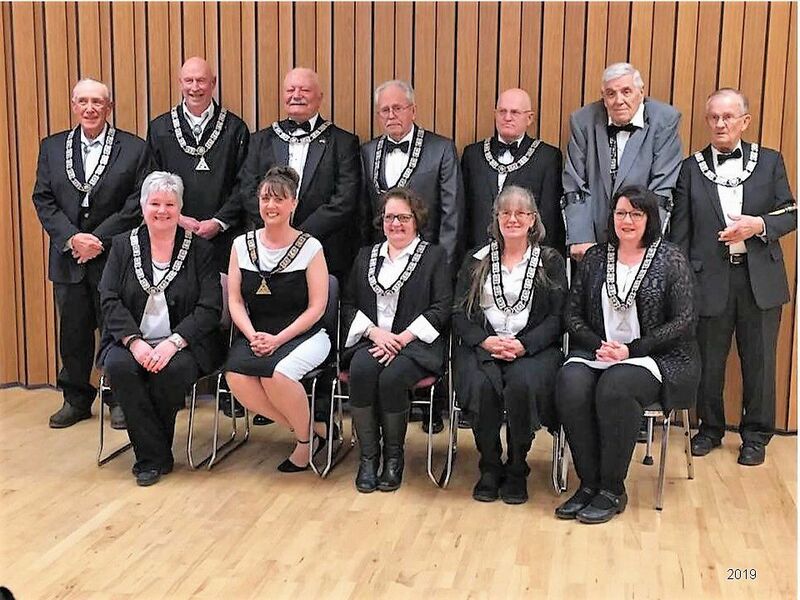 Deer Lodge Elks Lodge 1737 has installed a woman as Exalted Ruler for the first time since it was established in 1948. Michelle "Shelley" Steyh became the Lodge leader on April 6, during the annual installation-of-officers ceremony. She replaced Gerald Bender, who held the position for two years. The Benevolent and Protective Order of Elks was established in America in 1868 as a social club restricted to white men, but the organization gradually implemented a more inclusive membership policy. In the 1970s, unofficial Lady Elks auxiliaries were created. And at the BPOE national convention in 1995, members voted to remove “male” from national membership requirements. In 1997, Exalted Ruler Dave Austin initiated the first women – Verna Sanders and Shirley Cowan - as members of Deer Lodge Elks Lodge 1737. While Steyh is the first woman to become Exalted Ruler in Deer Lodge, other women have served in that capacity in Montana and around the country. Numerous Lodge members echoed Bender's assessment of Steyh, calling her a hard worker whose leadership skills are valuable assets. Steyh has belonged to the local Lodge for 16 years and credits her fellow members for welcoming her with open arms when she was new to the community and in the midst of a divorce. Since joining, she has also served as Leading Knight--a vice presidential role--and as Chaplain. For seven years, she has been chairman of the bike safety program, which she calls her pet project, and has even dressed as the Easter Bunny for the Elks’ annual community Easter egg hunt. Steyh noted that the Elks has a number of community initiatives that focus on everything from drug prevention to encouraging fishing to helping local veterans. The group also donates to the local food pantry and recently donated swimming vests to the Deer Lodge school district's Central Park Center. And the Deer Lodge Elks host Friday night dinners, cribbage games on Mondays and Bingo one Saturday each month, among other events meetings, receptions and parties. Steyh is a retired U.S. Navy petty officer first class who worked in law enforcement with the Naval Reserve unit in Helena for seven years. She is employed at the Montana State Prison, where she began as a correctional officer in 1994 and currently is a unit manager. She was recently named the prison's interim mental health service manager. She is also active in the American Legion, where she is the secretary. Her son Daniel recently returned home from service with the Marines. Another son, Brandon, is stationed in Hawaii with the Marine Corps. Her husband, Ron Steyh, and stepsons Cody and Chase also are prison employees. “It’s a family thing,” she said proudly. Originally from Terry, Steyh graduated from Dawson College in Glendive with a bachelor’s degree in criminal justice and an associate degree in law enforcement. She earned a master's in social work from the Missoula campus of Walla Walla University in 2015. “I’m always trying to improve," Steyh said.